Turkey’s strongman leader, Recep Tayyip Erdogan, relies on two things to win elections: a strong economy and nationalism. With the Turkish currency in free fall and the economy unravelling, he now desperately needs to mobilize the nationalist vote. A cross-border military operation in northern Iraq against the Kurdistan Workers’ Party, or PKK, would certainly do the trick. Momentum is building in this direction. But first, how did we get here? When Erdogan called snap elections for June 24, the economy was already showing signs of weakness. Inflation was high and the current-account deficit expanding. It was Erdogan’s insistence on low interest rates that caused the economy to overheat. Then, foreign investment began to grind to a halt, and there was also a rapid slide in Turkey’s credit ratings. Now, things have gone from bad to worse. As Erdogan declared he would continue to control monetary policy, the lira collapsed, losing almost 10 percent of its value against the dollar on May 23 alone. The central bank finally had to raise interest rate. As election day approaches, what gives the Turkish opposition hope is the well-established correlation between Erdogan’s electoral performance and consumer confidence. In the last two months, as consumer confidence dropped, so has Erdogan’s chances of securing an easy victory. Most polls now show that his Justice and Development Party, or AKP, will not be able to maintain a majority in parliament, despite its coalition with the ultra-right wing Nationalist Action Party, or MHP. According to most projections, Erdogan also will not be able to secure the presidency in the first round of voting, scheduled for the same day as the vote for parliament. To get elected in the first round, Erdogan needs more than 50 percent of votes, but most polls show him being able to pull in only 46 percent. This means a second round of voting can be expected on July 8 between Erdogan and Muharrem Ince, the center-left candidate of the main opposition Republican Peoples’ Party (CHP), whose support hovers around 30 percent. Ince will need significant Kurdish support to stand a chance against Erdogan in the second round. Thus, it was no coincidence that Ince visited the jailed leader of the Kurdish nationalist party, Selahattin Demirtas, last month. But there are limits to his charm offensive with Kurds, since he cannot afford to alienate the much larger Turkish vote-bank that is much opposed to Kurdish nationalism. Moreover, to beat Erdogan in the second round, Ince also needs significant support from the right-wing nationalist Good Party, formed by disgruntled members of the MHP. So, what will Erdogan do? He needs a major mobilization of the nationalist vote. Past experience shows that cross-border military incursions into northern Syria against Kurdish forces generate considerable support for the AKP, for Erdogan and for the Turkish military. Turks are very patriotic and the PKK is a group easy to demonize. This is why Erdogan is likely to resort to another major military incursion, this time in northern Iraq, against Turkey’s Kurdish nemesis. All signs point to this. Erdogan recently declared that the counterterrorism operation in Afrin, northern Syria, had been successfully carried out and “now it is time for Kandil in northern Iraq.” At an Iftar in the Kurdish-dominated Turkish province of Diyarbakır, he said: “June 24 [election day] will be a smack to terror barons in Kandil who knowingly send the youth of Diyarbakir to death.” Mount Kandil, located 40 kilometers southeast of Turkey’s border with Iraq’s Irbil province, is regarded as a crucial target for the Turkish armed forces. It became the main headquarters of the PKK in the 1990s. The area was frequently hit by the Turkish army in the last decade, causing tension between the Turkish and Iraqi governments due to the latter’s objection to the violation of its sovereignty. The Turkish military has been sending strong signals that a big operation could be on the cards. Throughout the last week of May, there were news reports about Turkish soldiers killed or wounded in clashes in Iraqi territory. Stories attributed to unnamed security sources also referred to Turkish commandos infiltrating into Iraq to cut off PKK supply lines near the Kandil Mountains. On June 2, Chief of General Staff Hulusi Akar visited troops based in the southeastern province of Hakkari, which borders both Iraq and Iran and is across from the Kandil Mountains, together with his top brass. 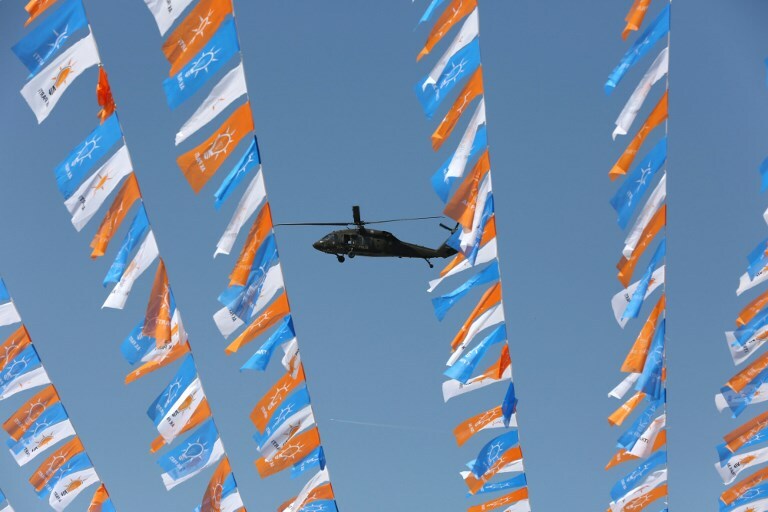 There is no indication yet whether a large Turkish cross-border operation in northern Iraq will start before Eid Al-Fitr on June 15, or before early voting begins shortly after Eid, or even just before polling day. But one thing is certain: Erdogan will be the main beneficiary of a military operation that galvanizes Turkish nationalism. Moreover, the main opposition CHP will have a much harder time courting the Kurdish vote when the Turkish army is engaged in a major incursion against the PKK. Economics may have dragged down Erdogan, but a resort to nationalism could handily win him the elections.